In a year of challenging weather conditions which have led wide-spread grass silage shortages, maximising the value of alternatives like maize could become increasingly important. Darren Ward, Volac business manager speaking at a briefing to discuss the company’s ’cut to clamp’ initiative, said: “Increasingly, farmers want to maximise their milk from forage output and we are seeing emphasis and investment in grazing initiatives, but in many cases this has fallen short when it comes to silagemaking. Mr Ward said UK-wide losses of feed in the clamp as a result of inefficient fermentation averaged at 8 per cent, with losses from aerobic spoilage or heating averaging 20 per cent. This translates to a 1,000 tonne maize clamp losing 200t. Volac silage microbiologist Philip Jones said feed quality was compromised by aerobic spoilage. “Maize is commonly harvested before it starts to die back, and greener leaves with a higher moisture content may need more help with fermentation. 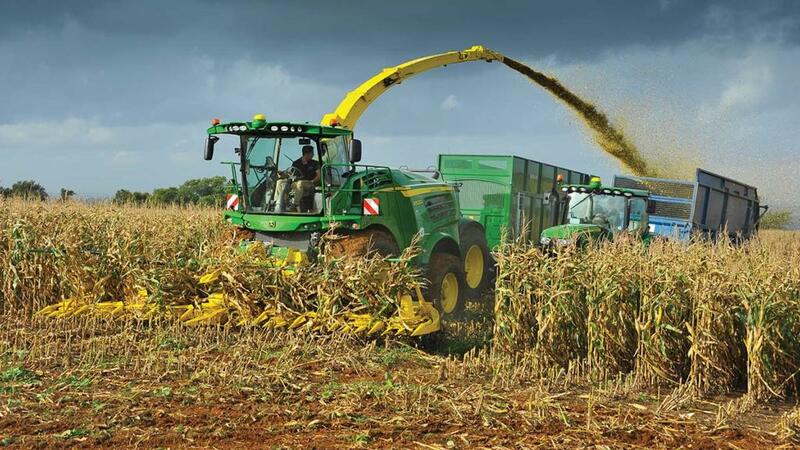 Good preservation is key to maintaining the quality of maize silage and to minimise commonly seen problems like inefficient fermentation and aerobic spoilage. Optimum cutting date, good consolidation, fast filling and tight sealing can be used to manage aerobic spoilage. Harvest according to dry matter (DM) levels and ensure ‘stay-green’ varieties have not expired past their best or dried off before cutting. Harvest should be done at 30 to 33 per cent DM which should correspond to the cob and kernel maturity and confirmed with a formal test. This can be examined by collecting at least five representative cobs and pulling back the outer leaves before pressing into the kernels which should result in a soft texture at the top of the cob, leaving no indentation. Then, break the cobs in half to examine kernels. A visible line will indicate where the solid yellow starch changes to the milky white sugar portion of the kernel. One-third to one-half of the kernel should be yellow starch. At least 15cm of stubble should be left on cutting to avoid soil contamination. The stem below this height is likely to risk mycotoxins getting in the clamp. Consider a chop length of 1.5 to 2cm. Maize silage can be prone to loses as a result of poor fermentation, which can result in the silage heating up and aerobic spoilage occurring. If considering the use of an additive, ensure the one selected will address the issues you want. Certain bacterial additives can be applied using low volumes of water, which may be considered if time or access to water is an issue at clamp filling. Additives are an essential part of silagemaking helping to preserve nutritional quality and improve fermentation quality, but they do not compensate for poor management. Ensure old silage is cleared, particularly if mould burden was a problem the previous year. Using a side sheet will make ensiling more thorough, keeping oxygen, and keeping area around the clamp clean will help to reduce soil spoilage organisms. Minimise air exposure by sealing the clamp within two days of cutting. Ideally, calculate the weight of machinery needed to achieve a target bulk density of maize in the clamp of about 750kg of fresh weight per cubic metre. To prevent mould, avoid leaving the sheet hanging over the face which creates a microclimate and roll back the sheet instead. Keeping the ground area clean will also help prevent mouldy spores blowing around which could contaminate the clamp.